It’s summer in England, or at least it was on Thursday, today there’s pouring rain and just a little bit of flooding, but that’s not so unusual for a British summer. There’s been plenty of rainbows in the sky, which makes being cold and wet a little more tolerable, they don’t help much with the pain of hail though. So to kid myself that the weather outside is not in fact frightful, I’ve been drinking some of the rose I bought for drinking in the garden on warm summer evenings. 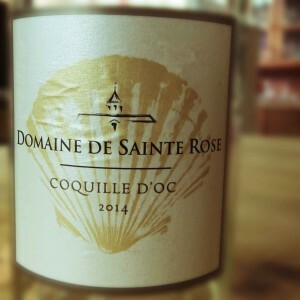 This Domaine de Sainte Rose, Coquille d’Oc Rose from Waitrose appealed to me for the fairly simple reason that it had a St James cockle shell on the label. By the time I’d picked it up, taken my glasses off to look closely at the label and realised it wasn’t from Santiago de Compestela, someone else had stepped in front of me in the rose aisle, so I popped it in my basket anyway. It’s a bright, strawberry shortcake, three year old spoiled brat in a Disney Princess outfit pink. It looks ever so slightly alarming, but it doesn’t smell the way it looks. From the colour I expected strawberries and bubblegum, but there was a more subtle grapefruit smell, pink grapefruit. It’s dry with a medium acidity, the alcohol level is at the higher end of medium. The grapefruit flavour carries through, but it’s rather like the Robinson’s Pink Grapefruit Barley Water that looks like the swil drink the dentist gives you. That’s my favourite flavour of squash, so that’s a good thing from my perspective. There’s a bit of boiled sweet flavour too. At £8 from Waitrose this was an enjoyable wine with a bit more fresh zip than many roses. I’d give it another go.